“Disturbing” video footage was released Monday by Florida police investigating a fatal shooting of a suspected shoplifter by a store owner who is also a city commissioner in a Tampa suburb. The police department in Lakeland, Florida, released surveillance video of the Oct. 3 shooting at the Vets Army Navy Surplus store that shows Michael Dunn, the store’s owner and a Lakeland city commissioner, confronting Cristobal Lopez, 50, about allegedly shoplifting a $16 hatchet, and then shooting Lopez as he tried to flee. Surveillance video captured the shooting death of Cristobal Lopez at the Vets Army Navy Surplus store by the store’s owner, Michael Dunn, after Lopez attempted to steal a hatchet, Oct. 3, 2018, in Lakeland, Fla.
“At this time, in the interest of transparency, although the criminal investigation continues to be active, we at the Lakeland Police Department have requested and received approval of the State Attorney’s Office to release all the videos which show the shooting that occurred on October 3rd,” the statement said. Dunn, 47, has not been charged in the shooting. The footage was released on the same day Lopez’s family and friends held a funeral at a mortuary in nearby Wauchula, Florida, and a burial service at the Friendship Cemetery in Zolfo Springs. Lopez family could not be reached for comment Monday. But Lopez’s sister, Veronica Lopez, told the Tampa Bay Times last week that her brother did not deserve to die. 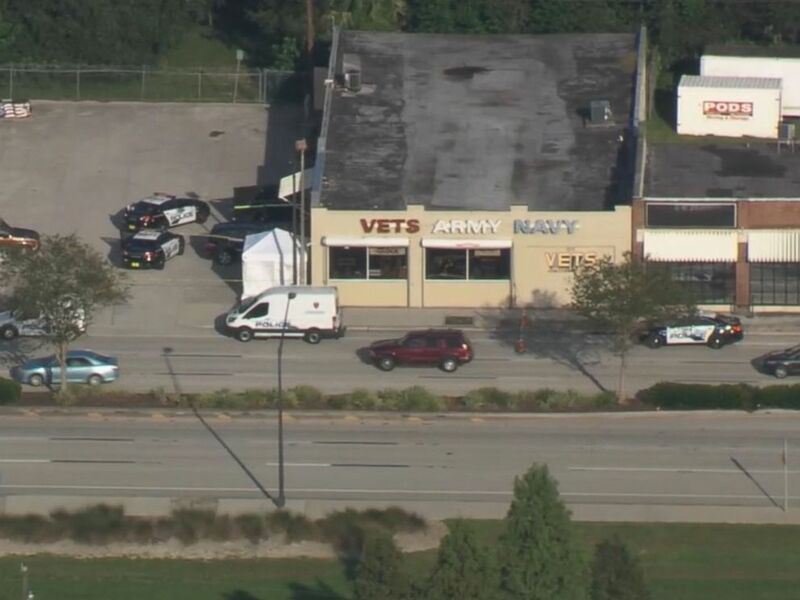 Police at the scene of a shooting at the Vets Army Navy Surplus store in Lakeland, Fla., Oct. 3, 2018. Police released four videos of the incident from different camera angles inside the store. The footage shows Lopez apparently removing a hatchet from a shelf and shoving it in his waistband. The same video also shows Dunn getting up from a desk in an office at the back of the store and walking to the front counter to confront Lopez. Another video taken at the front door of the store shows Dunn trying to stop Lopez from leaving and grabbing the man by his T-shirt while pointing a handgun at Lopez’s torso. The footage, which has no sound, captures Dunn firing his weapon and Lopez collapsing face down on the ground just outside the doorway, a hatchet falling near his right hand. In the video, Dunn is seen hovering over Lopez, who appeared to be moving before his body goes still. Dunn then walks outside the store and stands near the body, but in the video there is no sign that he offered medical aid to the mortally wounded man. Lakeland police said Lopez was declared dead at the scene by paramedics shortly after they arrived. “Lopez entered the store with his father,” police said in a statement on Oct. 4, the day after the shooting. “As his father was making a purchase, store owner Michael Dunn witnessed Lopez taking and concealing a hatchet, before trying to exit the store. Dunn stopped Lopez asking him if he was going to pay for the item and the confrontation ensued. Dunn’s attorney, Rusty Franklin, declined to comment Monday on the release of the video. 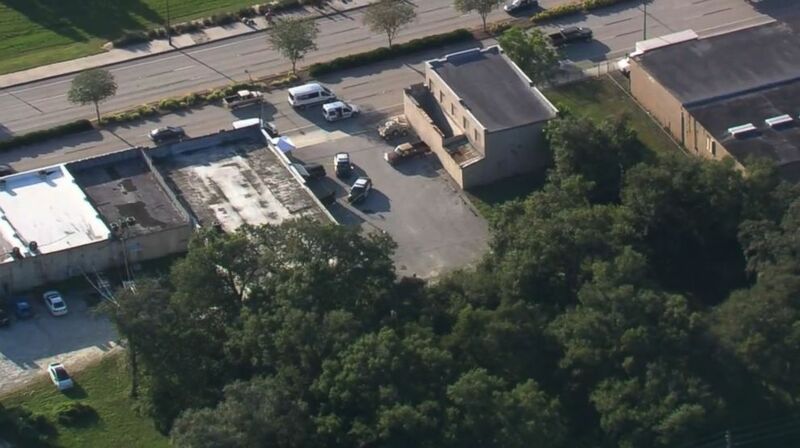 The lawyer would not say if Dunn’s actions are justified under Florida’s “stand your ground” self-defense law, which allows people to use deadly force if they feel their life or the lives of others are in imminent danger. “All legal defenses are under analysis and will be pursued,” Franklin told ABC News. During a news conference last week, Franklin said Dunn was interviewed for 45 minutes by police on the day of the shooting. Franklin said Lopez and his father had previously shopped in the store and that on the day of the shooting the two had come in to purchase hats. State Attorney Brian Haas said at a news conference last week that the investigation of the deadly shooting will be thorough.